Now, from the South and West the Pequod was drawing nigh to Formosa and the Bashee Isles, between which lies one of the tropical outlets from the China waters into the Pacific. And so Starbuck found Ahab with a general chart of the oriental archipelagoes spread before him; and another separate one representing the long eastern coasts of the Japanese islands- Niphon, Matsmai, and Sikoke. With his snow-white new ivory leg braced against the screwed leg of his table, and with a long pruning-hook of a jack-knife in his hand, the wondrous old man, with his back to the gangway door, was wrinkling his brow, and tracing his old courses again. "And I was not speaking or thinking of that at all. Begone! Let it leak! I'm all aleak myself. Aye! leaks in leaks! not only full of leaky casks, but those leaky casks are in a leaky ship; and that's a far worse plight than the Pequod's, man. Yet I don't stop to plug my leak; for who can find it in the deep-loaded hull; or how hope to plug it, even if found, in this life's howling ale? Starbuck! I'll not have the Burtons hoisted." "Let the owners stand on Nantucket beach and outyell the Typhoons. What cares Ahab? Owners, owners? Thou art always prating to me, Starbuck, about those miserly owners, as if the owners were my conscience. But look ye, the only real owner of anything is its commander; and hark ye, my conscience is in this ship's keel.- On deck!" "Devils! Dost thou then so much as dare to critically think of me?- On deck!" "Nay, sir, not yet; I do entreat. And I do dare, sir- to be forbearing! 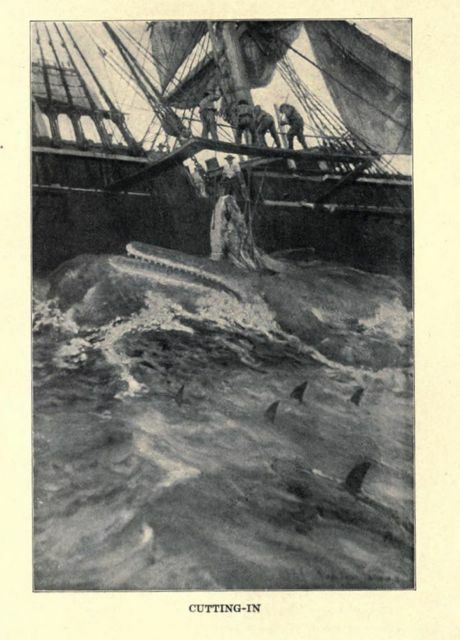 Shall we not understand each other better than hitherto, Captain Ahab?" Ahab seized a loaded musket from the rack (forming part of most South-Sea-men's cabin furniture), and pointing it towards Starbuck, exclaimed: "There is one God that is Lord over the earth, and one Captain that is lord over the Pequod.- On deck!" "He waxes brave, but nevertheless obeys; most careful bravery that!" murmured Ahab, as Starbuck disappeared. "What's that he said- Ahab beware of Ahab- there's something there!" Then unconsciously using the musket for a staff, with an iron brow he paced to and fro in the little cabin; but presently the thick plaits of his forehead relaxed, and returning the gun to the rack, he went to the deck. "Thou art but too good a fellow, Starbuck," he said lowly to the mate; then raising his voice to the crew: "Furl the t'gallant-sails, and close-reef the top-sails, fore and aft; back the main-yard; up Burtons, and break out in the main-hold."